Werribee Open Range Zoo is set within half an hour driving from Melbourne CBD. They are now can be a truly spectacular and unique venue for your wedding. With a capacity to serve 300 people, it is the place when you plan A Wedding Out of Normal. At Werribee Open Range Zoo, it provides a stunning natural garden for your wedding ceremony. When you say I Do in front of the family members and guests, this is the place to truly reflect your personalities. 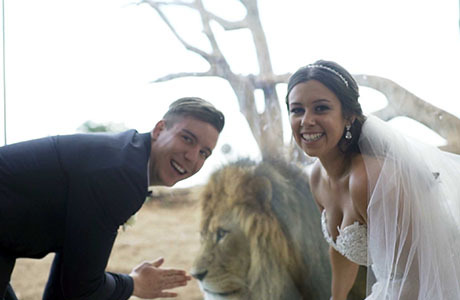 After the wedding ceremony, Werribee Open Range Zoo could provide plenty of wedding photography opportunities. The majestic trees, the manicured grounds, the animals from the whole world and the historic buildings are just a few for your wedding photographer to create a unique and artistic wedding day memory. The wedding reception is normally held at Meerkat Room. The outdoor deck provides an overlooking view of the lakeside cove and animals. The delicious cuisine, professional coordinating experience and friendly service provided by Compass Group team can make sure you already start experience a new wonderful journey of your life. As a wedding photographer for years, Werribee Open Range Zoo is on top of my recommendation wedding venue list when you plan a natural and unique wedding. Should you have any questions to plan a wedding at Werribee Open Range Zoo, please do not hesitate to Contact Us for the suggestions and information.